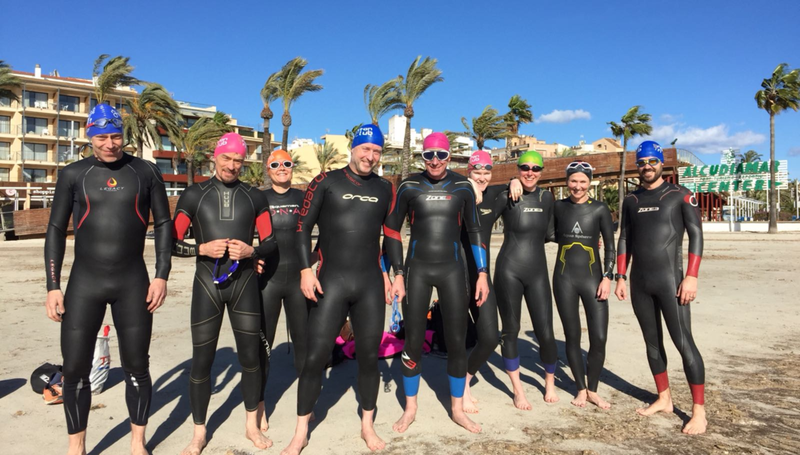 Got To Tri Camps, run by Santi Brage, a Bri Tri club member and last year's club chair, are held in the swim, bike, run mecca of Alcudia, Mallorca. This year 12 Bri Tri club members, including two club coaches, Graeme Cox and Rachel Perry, assisted by Phoebe Lebrecht, attended another successful week. The third Bri Tri camp was held between the 18th and 25th March at the luxurious 5-star Zafiro Hotel, set on a hill overlooking stunning mountain views, with what sometimes looked like staged sunsets, close to the beach and a lively port town. Bedrooms were spacious, with crisp cotton sheets, plenty of pillows, open space (great for bikes, wetsuits, and the over-flowing triathlete's luggage), powerful showers and big baths. Outside it seemed there were never-ending swimming pools, and sun loungers merging the outside and the inside. But this wasn't a week for lounging... or sun! It was a week for training, for laughs, and for learning. It's not every week that I manage to fit in 20 hours of training – and there's nothing quite as satisfying as seeing those big round circles, of varying colours on a Strava log. (And even though at home real life gets in the way - it's nice to know it's do-able). After the daily swim, the team headed off for a hearty, and healthy breakfast at the 5-star buffet, all of us hungry and enjoying fresh fruit, coffee, porridge, eggs, cakes... whatever we fancied indulging in! The cycle ride was planned in after this. For two days the weather stopped us cycling but we all managed to fit in four to five long rides of at least three hours over the six days. Group cycling skills were practised and refined (note for anyone new to group riding, try to get out on a group ride before the camp - there's lots to learn). We conquered big climbs from 7 to 10K, Strava segment club records were beaten, personal challenges and goals reached. We covered the 70.3 course (tough if you're considering taking it on); an iconic trip out to 'the lighthouse' where hordes of cycling tourists from around the world crawled like ants up and down the rolling course. We were rewarded with coffee, cake and some spectacular views on reaching the lighthouse (and the realisation that they had to do it all again on the way back). 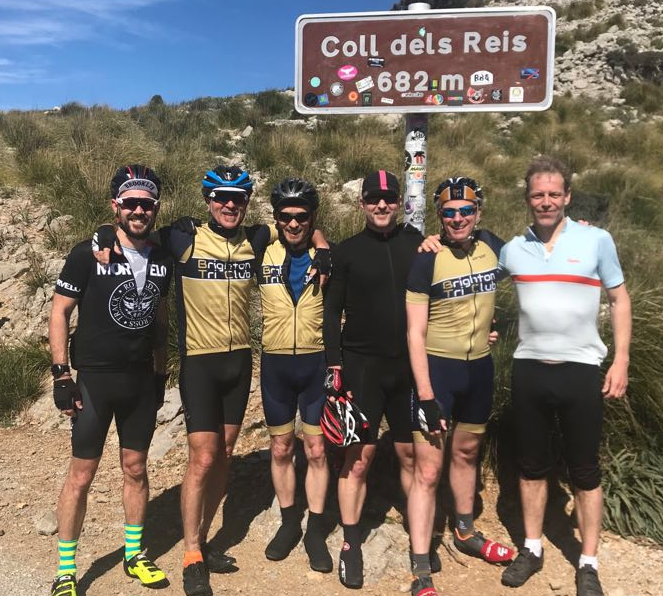 The famous 9.5km Sa Colobra climb ending at Coll dels Reis at 682m was taken on by the experienced club cyclists, with new member, Shane, reaching the summit in 37 minutes, and third time attendee Rich making it to the top of the mountain for the first time. On days when rain stopped play, gym and yoga sessions were on offer - and for some of the coaches, downtime included It's A Knockout-style challenge on giant inflatables in the outdoor pool. After swimming, and cycling, running was optional, and for those who decided to stretch their legs, the seafront provided the ideal track, with the guarantee of the company of other runners to keep the momentum going. Faces glowed as wine, beer, and lots of water washed down huge plates of food in the buffet at night. We were also offered talks from the coaches on nutrition, power on the bike and analysis of our swim stroke. By the end of the week, everyone had achieved and learnt something new, as well as had some belly laughs, banter and made new friends.